Yesterday, we went to Boone with Lyndsey and Lynne. We had a nice time driving around the beautiful mountains, eating at the Dan'l Boone restaurant, and hanging out at the Mast General Store. Haven had a glorious time playing in her food the other day. She loves bath time in her rubber ducky. She looked like an angel napping in our bed the other morning. She was sleeping so hard, I just had to take a picture. It's not our anniversary yet, that is in December, but yes I am already excited about it. Jeremy is celebrating 5 years at BofA as an associate. He actually started working there 6 years ago, but became an associate a year later. He was taken out to eat today by his coworkers and got a nice card from his boss' boss' boss. We are so proud of him and he has worked so hard. With all of the bad press BofA has gotten lately, I would just like to say that it has been a blessing for Jeremy to work there and we hope there are many anniversaries to come. for Kristin. She is 28 weeks pregnant and having a few symptoms of preterm labor. Would you ask the Lord to protect her baby and give her peace? She is on bedrest for the next few days until she goes back to the doctor. Haven was being so silly. Jeremy brought Haven and I flowers from our favorite Asian people yesterday! Haven got to play on the djembe drum. Haven's top right tooth popped through this morning. She hasn't slept great the past few nights, so I knew a tooth was on the way, but I didn't feel it until this morning. 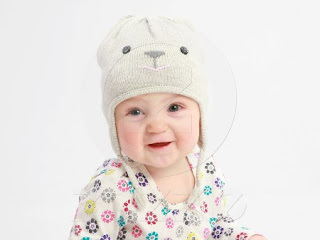 I can wait to see how cute she is going to be with top teeth! Haven is 9 months old and she is a ball of fire. She is known for her screams of delight, smiley face, and enthusiastic rolling. She is army crawling and creeping wherever her little heart desires. She waves and says "byebye." We are pretty sure that she knows that "dada" is Jeremy because it always fits the scenario. She is in a love/hate relationship with blocks. She adores "The itsy bitsy spider" and that song has gotten us out of many meltdowns. She is extremely observant and now enjoys pulling fuzz off of the rugs/carpets/toys. She then puts the fuzz in her mouth and chomps. We could have gotten rich off of her on Saturday at the Labor Day craft show at Oak Island because so many people stopped to ooh and aah over her. We should have charged $1 a show. Everybody says how happy Haven is. Pretty much every person we meet say, "She is such a happy baby." I asked Jeremy if he thought God was trying teach us something, just because it is so odd that we rarely get other comments. I'll take a happy baby any day over some of the alternatives! She is pure joy and we are having so much fun watching her grow. We had a visit today from Early Intervention and Mrs. Lou said she thinks she might be caught up by 1 year or really close. She is already functioning less than 1 month behind, not 2. Praise God! We went to Picture People tonight to get a few shots for 9 months. 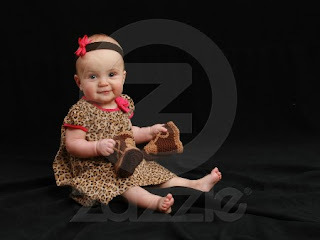 They turned out super cute with her squirrel hat and cowboy boots! We spent the weekend in Oak Island. Haven played in the sand and enjoyed getting wet in the ocean. It was a little rainy, so we just enjoyed the beach house most of the time. 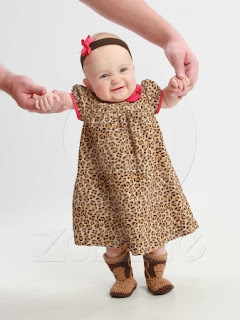 Haven is so photogenic, I thought I would share a few pictures even though there will be more posted tomorrow. She ate sand and didn't really like it. Can you tell? I almost got a good picture of her tooth. Can you see it? Meems and Gramps came to visit. She was sitting up well, but boy did she have sleepy eyes. So sweet. Something about this picture reminds me of my dad and cousin Jack.